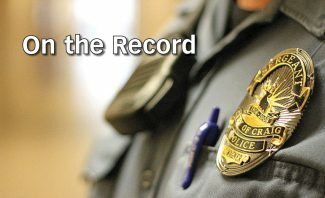 2:14 a.m. On the 3800 block of West Sixth Street, officers with the Craig Police Department responded to a caller who was concerned after hearing a male party screaming at a woman in a gold, four-door sedan while a small child was standing outside. When officers arrived, they determined it had been a verbal disagreement, and the man went back inside. 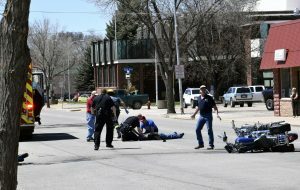 7:38 a.m. Near the intersection of East Fourth Street and Yampa Avenue, officers responded to a report of road rage. The caller reported a white, extended-cab Chevrolet with BLM insignia was speeding and was last seen turning into the BLM office. No contact was made. 8:46 a.m. In Craig, a Safe2Tell report came in and is under investigation. 8:50 a.m. In Craig, a Safe2Tell report came in and is under investigation. 9:44 a.m. In Craig, a Safe2Tell report came in and is under investigation. 11:41 a.m. On the 800 block of East Seventh Street, officers responded to a caller who reported a man wearing a Denver Broncos shirt was trying to sneak into a trailer. The party was contacted. Officer learned he and his mother are looking to rent the trailer. 4:43 p.m. On the 2000 block of Crockett Drive, officers responded to a report of harassment. One neighbor asked another neighbor not to have any contact with her. 5:34 p.m. On the 2300 block of Jeffcoat Drive, officers arrested a 25-year-old woman on a warrant. 8:29 p.m. On the 600 block of Wickes Avenue, officers investigated a report of possible identity theft. The caller is planning to go to the bank to get more information, and officers will follow up. 9:23 p.m. In Craig, officers responded to an allegation of domestic violence. A woman was reportedly shoved. A man fled with the son. The incident is under investigation. 10:08 p.m. On the 300 block of East Ninth Street, officers investigated a report of a suspicious person. 11:56 a.m. At the Public Safety Center, officers investigated a report of possible domestic violence. 4:43 p.m. On the 500 block of First Avenue West, a 38-year-old Craig man was arrested on a felony warrant out of Moffat County. 5:38 p.m. At the Public Safety Center, officers investigated a hazmat truck that was parked in front of the Public Safety Center and was blocking the entrance. It was moved. 6:47 p.m. In Craig, officers attempted to serve a warrant. 7:18 p.m. Near the intersection of West Victory Way and Yampa Avenue, a man called to report people had been following him around. He was contacted by officers and advised to call back with a license plate number. He was also advised to call back if he was followed again. 8:22 p.m. On Fourth Street, officers responded to a report of two vehicles racing. A 19-year-old Craig man was charged with vehicle eluding, speed contest, driving under restraint, reckless driving, reckless endangerment, speeding 20 miles per hour and over, operating an uninsured motor vehicle, third-degree criminal trespass, and failure to signal a turn. 8:32 p.m. On the 800 block of Jeremiah Avenue, a person reported a fraudulent Verizon account. The incident is under investigation. 11:21 p.m. At Woodbury Park, officers responded to a report of three or four people on top of one of the bathrooms and another two at the gazebo. Some people were contacted and told the park was closed and to head home. Officers checked the area and were unable to locate anyone else. 11:58 p.m. At the Popular Bar, officers responded to a possible fight. Before they arrived, two people fled behind the building. A third person left on scene and did not want anything done. 3:44 a.m. Near the intersection of West Seventh and Breeze streets, officers responded to a caller who reported a disturbance. Two people were reportedly yelling, fighting, and being loud. When officers arrived, they heard nothing. They tried calling the reporting party, but the caller hung up after answering. 10:47 a.m. Near the intersection of West Sixth and Green streets, officers issued a warning to a person on a bicycle. 1:22 p.m. On the 1100 block of Barclay Street, officers responded to a case of suspected identity theft. The matter is under investigation. 1:54 p.m. In Craig, officers investigated a suspected drugs violation. 3:09 p.m. Near the intersection of West Sixth Street and Yampa Avenue, officers made a traffic stop resulting in a warning to the driver for careless driving. The driver was also served with a trespass notice. 5:30 p.m. On the 600 block of Wickes Avenue, a caller reported her wallet was stolen from a playground area. Police were unable to contact the caller. They are awaiting a callback. 7:17 p.m. In Craig, officers responded to a report of suspected domestic violence. A man was yelling at his wife. The man was contacted. It was verbal only, and everything was OK.
10:19 p.m. On the 500 block of Yampa Avenue, officers issued citations to two bicyclists. 1:15 a.m. On the 700 block of East Victory Way, officers responded to a report from a clerk of suspicious vehicles. The clerk asked to have the drivers trespassed. When officers arrived, one person was trespassed from the store and warned about driving behavior. The other individuals went home. 2:44 a.m. On the 1200 block of Victory Way, officers made contact with a pedestrian and arrested the 28-year-old man for a city of Craig warrant for failure to appear on a traffic offense, unlawful possession of a controlled substance, and unlawful possession of drug paraphernalia. 8:39 p.m. At the Public Safety Center, officers made contact with a pedestrian. A man came into the lobby for a job application. 10:17 a.m. On the 600 block of Tucker Street, officers were called to a report of a burglary in progress. The caller reported children were attempting to break into an abandoned house. The children were reportedly wearing all black and riding bicycles. Officers were unable to locate them. 1:14 p.m. On the 1000 block of West Victory Way, officers responded to a caller who wanted to speak with an officer about a threat. 1:54 p.m. At Elk Run Inn, officers assisted a motorist. The transmission of a truck blew on Victory Way between Ranney and Green streets. A tow truck was on scene, and the truck was towed. 3:55 p.m. On the 500 block of Pershing Street, officers responded to a caller who said a man was parked on his property. The property owner said he almost hit the vehicle and was threatened by the other driver. The caller didn’t want anything done, but said he would call back if the threatening person returned. 8:21 p.m. On the 600 block of Wickes Avenue, officers responded to a caller who heard suspicious sounds. The caller thought they heard a woman threatening to call the police. Officers made contact and determined it was a verbal disagreement. The man left for the night.